Solvent-based, low-odour wax stripper for extraordinary cleaning of dirt and inorganic residue. 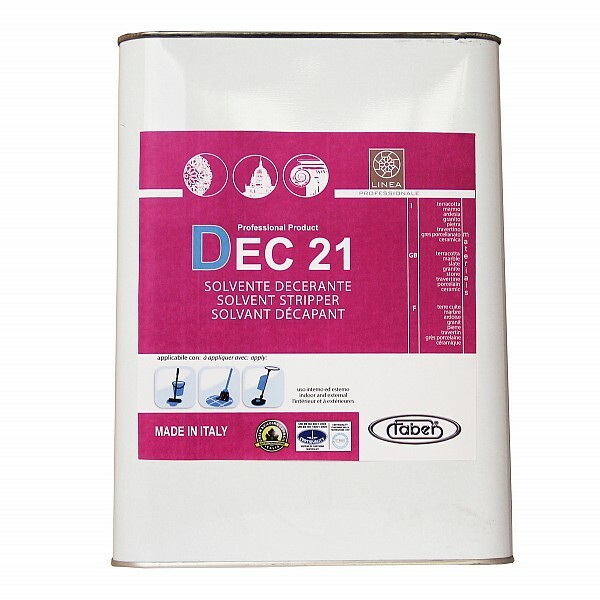 DEC 21 is a mix of organic solvents and wetting agents that is used to strip wax deep down from surfaces. It is able to remove old residues of synthetic and organic wax, sealants and water- or solvent-based treatments, impregnators, greasy or oily surface stains, or deep, long-standing oily dirt. DEC 21 is recommended to remove previous coats of solvent-based products or to completely strip wax from flooring to restore its original appearance. Although it is extremely effective when it comes to removing dirt, wax, and previous treatments, it will not damage surfaces or change their appearance. DEC 21 is a product that as well as being suitable for use on its own, is often used together with one of Faber’s strong alkaline-based degreasers, such as COTTOSOLV or DECERA/P, for a full, deep wax removing action, known as “double wax stripping” Double wax stripping is an operation developed especially to remove any organic compound or residue from a surface, such as, wax, resin or previous treatments, for example, or even layers or stains of oily dirt.